Published on January 7, 2017 in Culture, General T&T, India and Passed on. 1 Comment Tags: Anand Yankarran, Stephen Kangal. It is with deep sadness that the national community and the T&T diaspora received the news of the untimely and premature demise of the late Anand Yankarran, the veritable baritone singer of the chutney genre of music. Published on November 20, 2016 in General T&T, India and Race and Identity. 4 Comments Tags: Indian Indentureship, Selwyn R. Cudjoe. Samoondarie Doon, perhaps the last survivor of Indian indentureship, died on November 15. This final part of Sirdar Choonee’s story may be a fitting reminder of her people’s tribulations. The italics in this essay appeared in the original transcript. Published on May 31, 2016 in General T&T, Hindu, India, Law, Media, Politics and Religion. 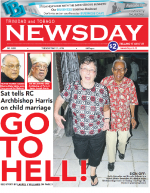 14 Comments Tags: Child Marriage, Hindu, Joseph Harris, Newsday, Roman Catholic Archbishop, Sat Maharaj, SDMS. That was the “message” Secretary General of the Sanatan Dharma Maha Sabha (SDMS) Satnarayan ‘Sat’ Maharaj sent publicly for Roman Catholic Archbishop Joseph Harris in light of the controversial debate on child marriage and the law. “Mr Archbishop and all you other people, look at the mote in your own eye before you point out the mote in the eye of the Hindu. Published on October 16, 2014 in General T&T, India and Schools. 5 Comments Tags: Hillview College, Ronaldo Ram, Stephen Kangal. Mr. Principal Mr Leslie Mahase Chaplain of the College, Rev. Adrian Seunarine, Minister of Energy and Energy Industries Senator the Honourable Kevin Ramnarine, The Honourable Rudranath Indarsingh MP, Minister in the Ministry of Finance and the Economy, Mr. Ranjit Boodhoo, Chairman of the Administrative Committee of Hillview Colllege, Mr.Shivan Ramroop, Hillview PTA Rep., Mr Fareed Ali, Secretary of HOBA, Members of Straff of Hillview College, National Scholarship Awardees, Parents, Students, other guests, Ladies and Gentlemen.